Shopping at Kohl's has never been simpler. 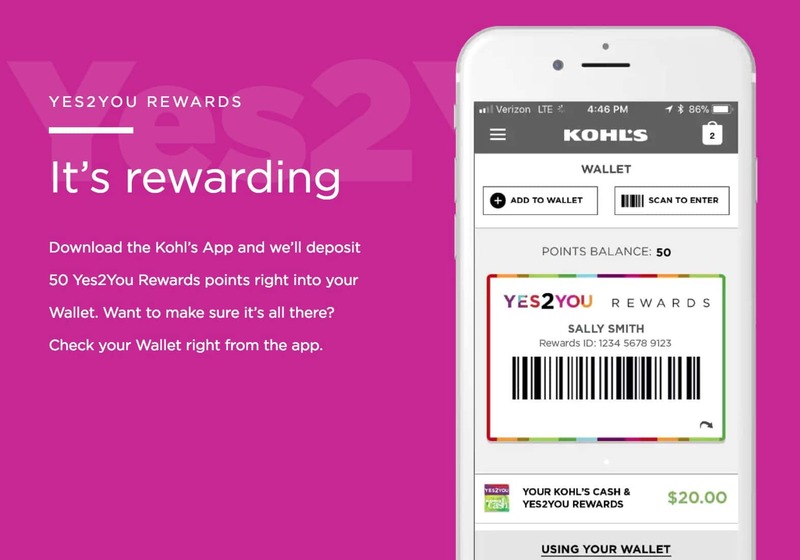 As a loyal Kohl's shopper, I'm always putting my Kohl's coupons and rewards to good use -- and the store's app promises to make that process way easier. If you love Kohl's like I do, now is the time to download their app. Especially since the retailer will give you 50 Yes2You bonus points just for trying it out. The Kohl's App is specifically designed to simplify your overall shopping experience, and it allows you to shop Kohls.com and in-store sales better than ever before. The app keeps your coupons and rewards all in one place, and it features helpful shopping tools and incentives to save you time and money. The mobile wallet keeps everything you need right at your fingertips. This includes your accumulated Kohl’s Cash, Yes2You rewards, coupons, promotions, and even gift cards. Since everything is readily accessible, you won't have to rummage through your purse looking for your Kohl's Cash or pull out your wallet to swipe your store credit card. Instead, all you need is your phone. Plus, you'll never have to worry about misplacing your Kohl's Cash vouchers and then miraculously finding them again the day after they've expired. When you consider that Kohl's cardholders account for roughly 60% of the store's total sales, it's not surprising that Kohl's intends to keep them collectively happy. 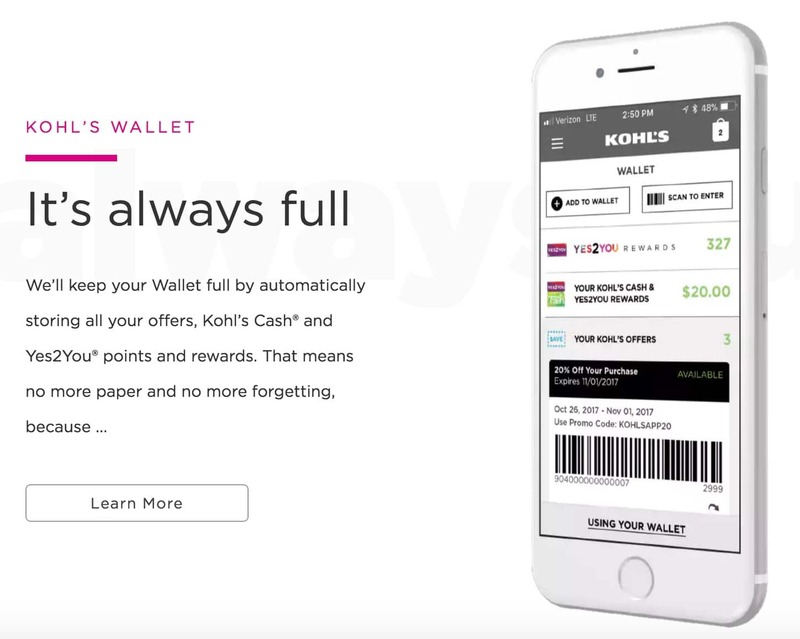 In 2016, the store debuted "Kohl's Pay," a smartphone-driven project that allows the store's 25 million cardholders to "put the plastic away." 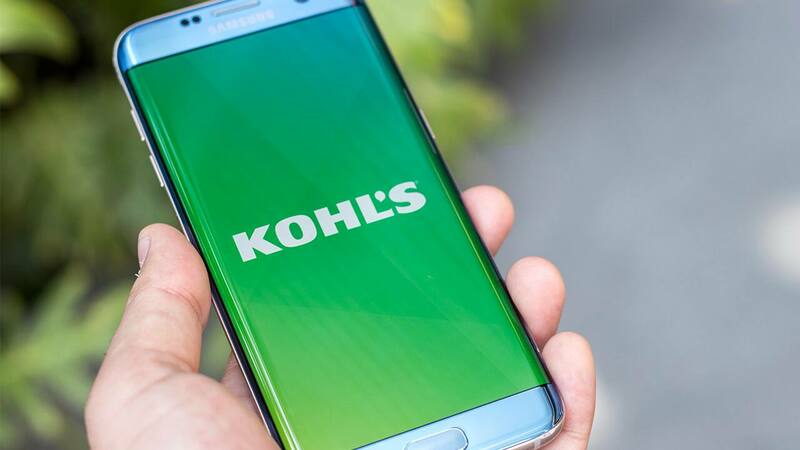 Kohl's Pay is exclusively reserved for store charge-card holders (the app itself, however, is available to all shoppers.) The feature is aimed at creating a better in-store experience by connecting customers' store credit cards to their mobile devices, while also combining Kohl's coupons, promotions and rewards for a paperless transaction. Cardholders can use their smartphones to pay via a QR code that's scanned at the register, making each transaction fast and seamless. You'll need a Kohl's credit card to get started, and you'll have to download the Kohl's app. As the Kohl's website explains, if you have the Kohl's app and the store credit card, you're basically signed up already. All you'll need to do is verify your charge card information on your smartphone. Just open up the Kohl's app and click on "Kohl's Pay," which is located in the drop-down menu on the lefthand side of the screen. From there, you'll confirm your credit card information. The entire enrollment process takes about 10 seconds. Then just add any rewards or offers to your account and you're all set. Just open up the store app and add any coupon codes and paper rewards to your mobile wallet before you head to the checkout line. 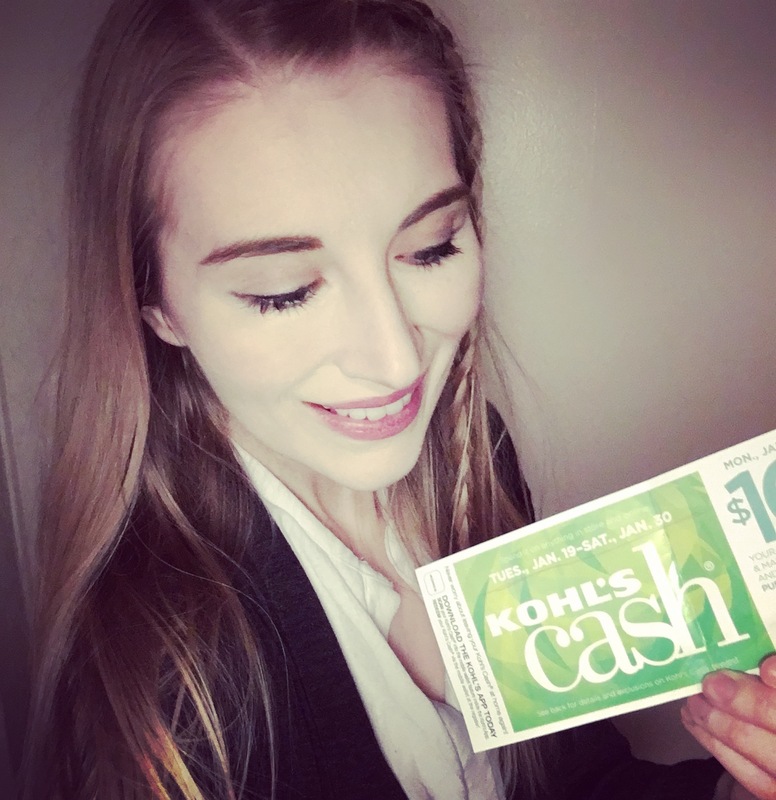 You won't have to worry about having your Kohl's Cash on hand, because Kohl's Pay automatically tracks and redeems your rewards. It also makes returns a breeze. Another paperless bonus? Cardholders score $10 in Kohl's Cash just by signing up for paperless billing. Overall, Kohl's Pay is a pretty savvy enticement to get Kohl's shoppers interested in applying for a Kohl's charge. Though the store's credit card already has many fans due to its year-round perks. 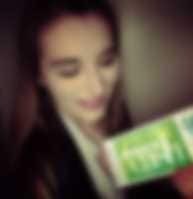 Slickdealer cocoapuffs says, "The Kohl's card is worth getting for the exclusive promo codes alone." While Slickdealer Moooshe raves that it lets you "score some really sweet deals," like 30% off coupons and free shipping with no minimum during credit events. Open the app inside a Kohl's store and you may receive bonus Yes2You points or exclusive savings. Just remember to connect to the store's Wi-Fi first. 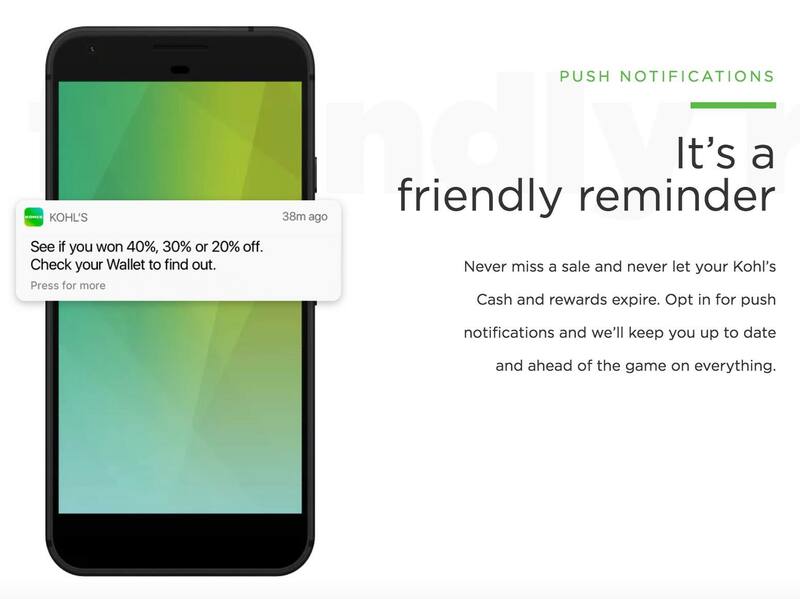 Push notifications may not sound like a perk, but they're actually a great way to stay on top of the store's latest promotions. My favorite reminders are for the store's mystery codes. Once a month, Kohl's sends out one-time-only codes for 40%, 30% or 20% off your purchase. The push notifications remind you to check your email for these discounts. The app allows store cardholders to manage their Kohl’s charge card accounts and pay off their balances any time, any place. The app includes a range of shopping tools, including a barcode scanner that alerts you to any current promotions on a particular item and shows a product's customer reviews. You can shop by category, create a wish list, or even scan a friend or family member's Kohl's registry. Another interesting tool is the "Snap & Shop" feature. Just tap the search bar at the top of the home screen to begin your search. Select a photo of something you're looking for, and then Kohl's will search its inventory for similar products. Use the "My Store" feature to shop a specific location's inventory from your phone. If you find something you love, buy it on the app and pick it up in that store free of charge. Overall, the app is a handy tool for keeping all of your money-saving rewards and deals right within reach. Not only is it useful for your shopping trips, but it can help you rack up rewards even faster. The final verdict: We "app"-rove.